Saxe-Coburg-Gotha. Carl Eduard gold Proof 20 Mark 1905-A PR65 Ultra Cameo NGC, Berlin mint, KM172, Jaeger-274. One-year type. A seldom-rivaled proof of this distinctive issue, fully Gem in its preservation, with captivating contrast between the raised design and the fields, and carefully maintained surfaces that show only the barest trace of tone on both sides. The overall strike is also quite notable as superior, as proofs strikings of this type tend to show weakness on Carl Eduard's high cheek bone, and as a result, remnant marks from the unstruck flan. 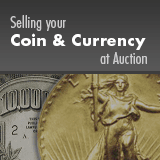 Currently the finest graded coin at NGC, with a single "+" designated coin of the same grade only slightly besting it at PCGS.